Fava, not to be confused with fava beans, is a traditional Greek dish made of pureed yellow split peas. 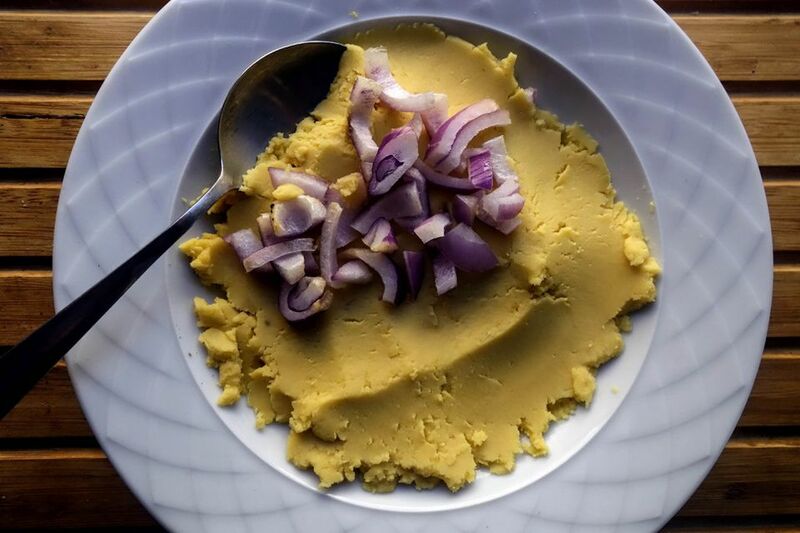 Fava is an easy dish to make, and not only is the bright yellow color a pretty addition to any table, but it is also filling and nutritious. Fava is meant to be eaten at room temperature and is usually served as an appetizer, called meze in Greek cuisine, as well as a side dish or a precursor to a main dish of fish. Fava goes particularly well with dark leafy greens, and is delicious alongside anchovies or sardines, kalamata olives, and feta cheese. To finish it off, drizzle the puree with some fruity olive oil before serving. Look for the peas at a Greek grocer, or you can substitute ​yellow daal (moong) from an Indian market. If you are lucky, you may find the yellow split peas at your local grocery store. This recipe uses a pressure cooker, but you can simply cook in a pot on the stovetop. Put the peas in a pot with enough water to cover generously. Bring to a boil and cook 5 to 10 minutes until froth rises to the top. Drain the peas and rinse well. In a pressure cooker, add the 4 1/3 cups water and peas. Bring to a boil, seal, and when pressure reached, reduce the heat to low and cook for 10 minutes. Use fast-release of pressure, and open the pot. Purée the peas and liquid in a food processor bowl or with an immersion blender, and return to the pot. Add salt and oil. Cook uncovered over the lowest possible heat for 15 minutes until it becomes the texture of thick cream, stirring with a wooden spoon to prevent sticking. Serve at room temperature in shallow bowls topped off with a drizzle of olive oil and a tablespoon of diced onion.